Many people love the big head little bodies caricatures style and our artist Luis is expert at this. 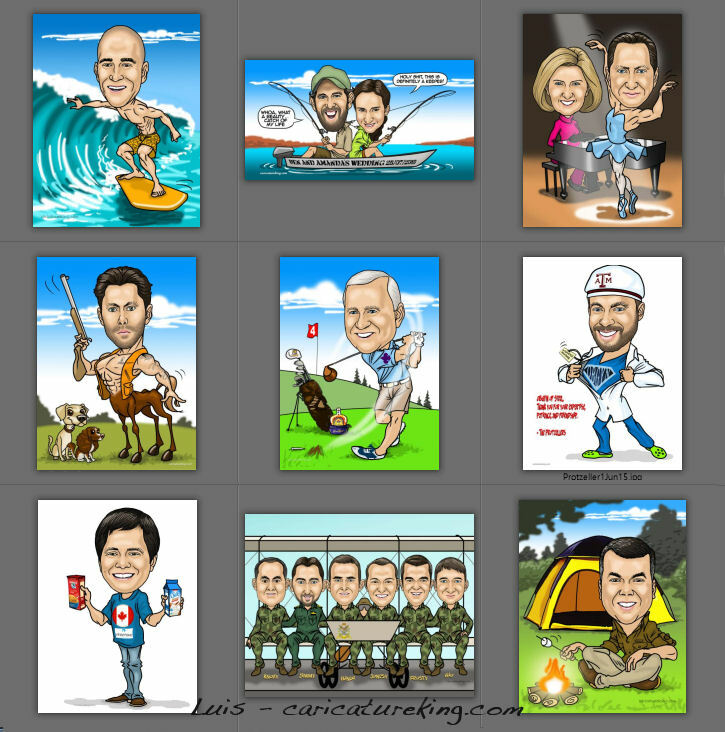 These recent examples of his work shows off his flexibility in creating caricatures perfect for gifts. No matter if you are looking for a gift for a golfer, a gift for a fisherman, an unusual gift or a gift for a quirky person or couple, a big head little body art gift is perfect. People have ordered big head little body cartoon caricature gift art from Luis for birthday, wedding, retirement and end of training course occasions! See more of Luis’s work here on this blog or on the main website. All we need are some clear photographs of heads and a pic of bodies so the body shape can be correct (although we have slimmed and added muscles on request!) and if including a background a description and maybe some helpful source images.